Below I reproduce a briiliant article by Sue Reid from the Britain's Daily Mail. It is a must read for every American, Kiwi, Briton, Australian, Canadian, South Korean, Taiwanese, Japanese, Israeli, South African, European or Latin American who cares about saving and restoring what's left of the West. The article confirms a major theme of New Zeal-that the real danger to the West, the real threat of communism and socialism is not terrorists or atom bomb spies. It is the traitors and stooges who infest the mainstream left-The British Labour Party , New Zealand Labour, Australian Labor, the Canadian Liberals, Israeli Labor , the South African ANC, the French Socialist Party and most obviously of all, Barck Obama's Democratic Party. The real secret of socialism is the ability of small cliques of foreign directed communists and socialists, to direct, through the union movement, peace movement and other pressure groups and direct infiltration, the policies and direction of the mainstream political parties. The KGB were always subservient to the Soviet International Department-which answered directly to the Politburo. The international Department were not spies per se-their job was to influence Western public opinion and government policies through infiltration and manipulation of Western institutions-the media, unions, "peace" movements and most importantly, the mainstream political parties-manly, though not exclusely, those of the left. This article is historical, but points out that this process has left a legacy. I go much further-I say the process is ongoing and continues to be directed by the "former" KGB men now in charge in Moscow, the Marxist-Leninist leaders in Beijing, Havana and now Caracas. Lancashire blacksmith's son and leader of the Communist Party of Great Britain stood in front of the group of high-flying young Left-wingers at Cambridge University. It was a few years after World War II and they took Pollitt at his word. Within a decade, the Communist Party foundered (its membership peaked at 60,000 in 1945) as Pollitt's bright young devotees infiltrated the Establishment. They were soon exercising considerable influence in universities, the state education system, publishing houses, the legal hierarchy and the civil service. But it was in politics that these high-flying members of the Left established their greatest power-base, both in the Labour Party and the trades' union movement. Just how deep the tentacles of communism reached into the heart of British government has now been revealed with the emergence of an extraordinary diary by Anatoly Chernyaev, the Soviet Union's contact man with the West at the icy height of the Cold War. Meticulously detailed and written by hand on lined notepaper, the diary has come to light in the U.S. National Security Archive. It tells the story of a 'special relationship' not between Britain and America - but between the British Labour Party and Soviet communists. It was a relationship that lasted more than 30 years, right up to Margaret Thatcher's arrival as Prime Minister in 1979 and beyond. Indeed, one of the most shocking of the diary's many revelations is how Labour leaders Michael Foot and Neil Kinnock colluded with the Soviet communists to try to beat their 'common enemy', Margaret Thatcher. But more worrying, perhaps, is the fact that the document shows in stark detail how the political ideology of so many of those who govern us today was shaped by the unspeakable communist creed of the Soviet Union. The unpalatable truth is that many ministers in Government today rose through the ranks of a British socialist movement that was heavily influenced - and even controlled - by the Kremlin in Moscow. Svetlana Savranskaya, Director of Russia Programmes at the U.S. archive, describes Chernyaev's diary as 'the single most authoritative source on Soviet policy-making in the last 20 years'. Its explosive contents have only just emerged because the pre-1985 entries remained untranslated until now. 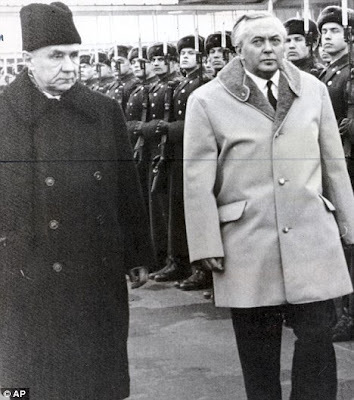 Chernyaev was deputy in the Soviet International Department and later an adviser to President Mikhail Gorbachev. Today, he is 88 and lives in obscurity outside Moscow. And while many senior members of the Labour Party and union movement will be appalled at his revelations, the old KGB hand himself is delighted his memories are being published. In Britain, those on the Left who know about the depth of the Soviet influence over this country in the latter half of the 20th century, have maintained an embarrassed silence about this shameful episode in British political history. Above all, the intimate co-operation between Moscow and the trades unions which nearly brought the country to its knees in the Sixties and Seventies has been an utterly taboo subject. It is true that tantalising slivers of information have emerged over the years. As the Mail revealed last month, Transport and General Workers' Union leader Jack Jones - who received effusive praise from Prime Minister Gordon Brown when he died in April this year - was a paid agent for the USSR. In exchange for information, he used to take cash handouts from his Soviet handler in London, Oleg Gordievsky, even as late as the 1980s. But this diary reveals that the cosy relationship between the Kremlin and Labour was far more widespread than previously thought - and had been going on for years. One of the key figures in this murky affair was Ron Hayward, the Labour Party's general secretary between 1972 and 1982, who died in 1996. He told Chernyaev at meetings in Moscow and London that he was determined to provide a 'genuine socialist government' for Britain. 'To achieve that, he believes he must break the Labour Cabinet,' recorded Chernyaev at the time. It is clear from the diary that Hayward envisaged a real Soviet-style system in Britain, with the Party General Secretary (ie Hayward himself) - not a Prime Minister selected by MPs - at the very top. He would refer to himself openly as the 'party leader'. More specifically, he informed the Soviets that he wanted to develop a cadre of young activists to prepare for Communist rule. 'I am the first Labour leader in British history who is not afraid to come out alongside Communists with the same agenda', he said, boasting that he prepared like-minded young people, put them in the right places and helped them to become prominent. In 1974, when Harold Wilson was Labour Prime Minister, Hayward smuggled Chernyaev into the heart of the Labour Party conference to try to spread the Kremlin's influence still further. Some of those in the conference hall recognised the Russian - but did not dare admit it. Chernyaev records in his diary how he and Hayward ran into Edward Short, the Labour Party deputy leader who had been with a Labour delegation to Moscow the year before. Games, of course, they were not. In those years, the Labour Party was tightly controlled (and largely financed) by its affiliated trades unions, which chose dozens of candidates for safe Labour seats. And it was in the unions where Chernyaev's International Department aimed to infiltrate the deepest. The regular to-ing and fro-ing between union leaders and Moscow was commonplace - even in 1980 after Mrs Thatcher's Tories were in Government. That year, the diary says, the TGWU's deputy leader Alec Kitson turned up drunkenly at a meeting with Chernyaev in the Russian capital. He had been drinking with his Soviet trade union counterparts for hours beforehand. 'There was a f*** in every sentence that came out of Kitson's mouth,' the diary records. But when Kitson sobered up, he and Chernyaev concocted a plan to send a team of Russians to the Scottish TUC conference 'to deliver the Soviet point of view'. They arranged another brainwashing session with union leaders in London. Later in 1980, in Blackpool in October, Chernyaev openly attended a TGWU-sponsored drinks reception on the eve of the Labour Party conference. The diary says that Jenny Little, then secretary of the international group of the Labour's National Executive Committee, which oversees policy-making, played a pivotal role in Chernyaev's extraordinary access. During the 1980 party conference, 'she tried to sit me down next to Jim Callaghan (the former Prime Minister who was then Labour leader), but he bypassed me as if I was a column. She herself was embarrassed'. 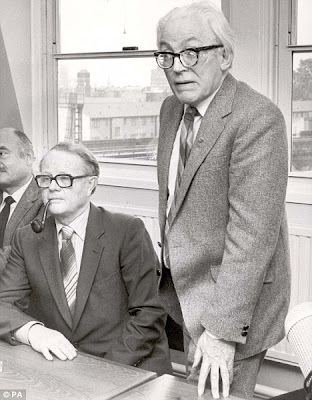 Party leaders such as the donkey-jacketed Michael Foot and the Welshman Neil Kinnock were at times deeply reverential to their Russian 'comrades', the diary reveals. In 1981, Foot led a big delegation to Moscow, to discuss multilateral disarmament with the Soviet leader Leonid Brezhnev. 'Dear Comrade Brezhnev,' Foot said while holding Brezhnev's hand in both his own. In December 1984, Kinnock went to Moscow accompanied by, among others, the young Charles Clarke and Patricia Hewitt - both to become ministers in Blair's government - to see Brezhnev's successor, the senile Constantin Chernenko. Chernenko read his brief to them and listened indifferently to Kinnock's verbose response. However, the Russian promised he would help in the Labour Party's attempts to oust Margaret Thatcher from power. Chernyaev notes that in 1985, Kinnock again turned to Moscow for support, sending a shadow minister to the Kremlin for advice on how to topple Thatcher, who was in her second term in office. It is not just the Left's close connection with the Soviet Union, but the lasting influence of that connection that should concern us all. One of Jack Jones's brightest proteges, after all, was Gordon Brown. The decision to give the young Scotsman his first and only safe seat, Dunfermline East, was made by two TGWU senior officials - one of them was Jack Jones, the other the drunken Alec Kitson. Both were friends of the Kremlin. The union's patronage was ubiquitous. Neil Kinnock and Tony Blair, as well as Cabinet ministers Margaret Beckett, Harriet Harman and John Reid, were all sponsored by TGWU and made their Labour Party careers thanks to it. The control the Soviets had over Labour, its leadership and aspiring politicians, is still having a profound impact on Britain. As the Spectator says: 'Indeed, New Labour, which has governed since 1997, cannot be understood unless these communist influences are taken into account. Yet even with the emergence of this diary, we still do not possess a full picture of how deep the dangerous Moscow penetration really went. Only as more truths trickle out of Russia will we learn the entirety of the betrayal. As for Harry Pollitt, the British communist who played such a vital role in the Soviet infiltration of this country - encouraging the acquiesence of those in powerful places on the Left - he is better known in Moscow, where he is proclaimed as a hero, than here. In 1970, some years after his death, the USSR issued a postage stamp with Pollitt's picture on it. A year later, in 1971, his devotion to the Soviet cause and to the spread of 'international communism' was further acknowledged by Moscow. The Soviet navy launched a new battleship and named it after him. Meanwhile, his many disciples in the fifth column he created in Britain continue to exert their malign influence. More from Sue Reid on Jack Jones here. and in nz we have the labour party president also president of a large union. If only we had a Thatcher or Reagan. You might like these videos from a 1983 interview where a former KGB spy describes how they infiltrated American society in the 1960s. I found them fascinating. Here's the first of 7 (they're about 10 minutes each). If you want to watch the other 6 they're easy to search for on Youtube. The Yuri Bezmenov interviews are very appropriate viewing for anyone interested in the western worlds dramatic decline.Yuri makes it very clear we have been the unwitting victims of a long range strategy dreamed up and implemented by the Socialists long ago ,we are now starting to see this evil agenda bear its deadly fruit. John Key is part of the problem not the solution, he is a mealy mouthed ,feeble minded halfwit like so many others sucking on the public teat in this country of ours. Thanks Trvor, I am happy to see you back on line. Your history lessons on the useful idiots of the Left is most welcome!